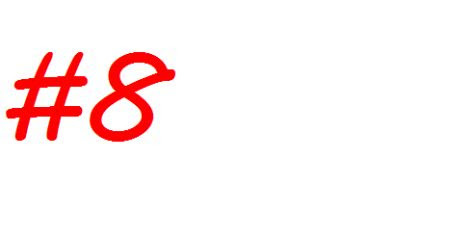 We're halfway through our 13 in 2013 Challenge. Aren't you proud? 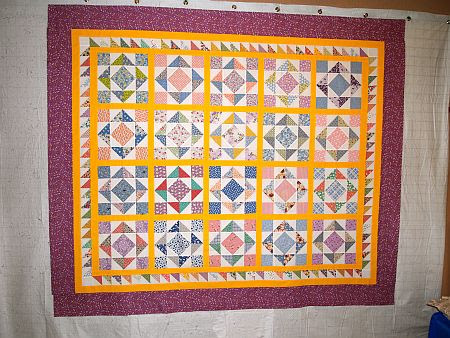 The first June "13 in 2013" finish is by Deb Cline. 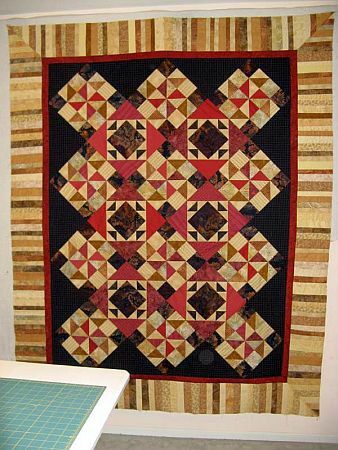 I love this "Shadow" quilt -- sigh, another one for my "I want to make this quilt" list! The best part is, it's an original! Deb says "I made it up as I went along!" I don't know if I missed adding this one to the May Parade, or if Deb is just our token "overachiever" this month, but she has two more UFOs to add to our Parade! I love your "Southwest-y" colors, Deb! 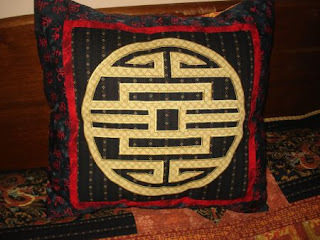 Martha, this one is adorable -- and my favorite V. and Co. collection, too! She also made another of her clever "photo frame" wall hangings. 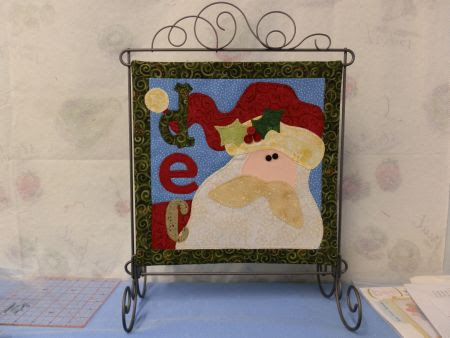 If you haven't seen Irene's wall hanging photo frames, go to her blog, here to see how she does it! 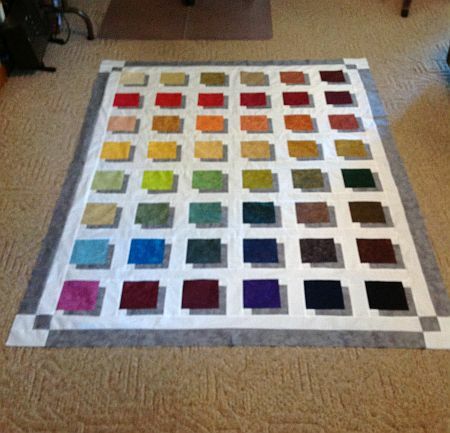 I must share two photos of Debra B's finish this month, because it is really an accomplishment! Debra says she only had the fabrics pulled for this one, so it was a start-to-finish UFO! And she sent the photos of the finished project with more than a week left in June! My #9 is Bonnie Hunter's Blue Ridge Beauty. 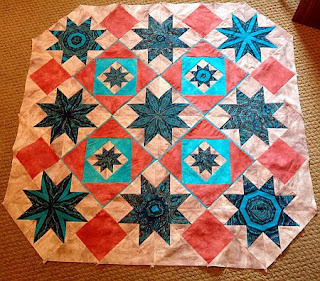 I only had fabrics pulled when this number was drawn - I had to make the quilt from the very beginning. I am very happy with the way it turned out. 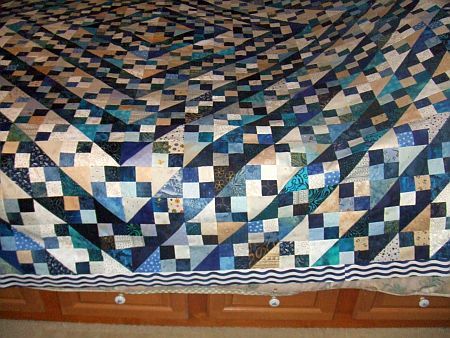 I love the blues and the barn raising layout. 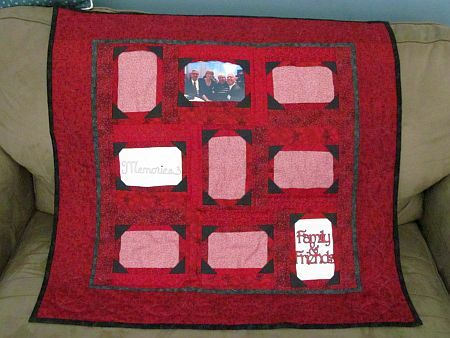 I was making quilts this year as Christmas gifts - now I am having second thoughts (smile, smile). I am soooo looking forward to the next challenge. 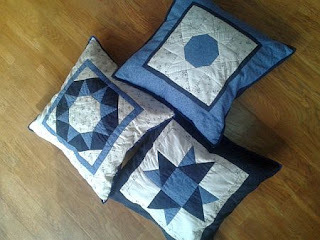 June must be a "blue" month -- Sue made three (yep, three!) 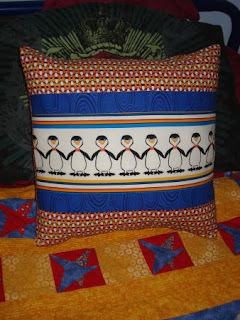 gorgeous blue pillows this month. I love Marti's UFO sew along. Its so much easier just knowing that you're going to get at least one project done and dusted each month, whereas a list just feels so daunting and you don't know where to start. Thanks, Sue, couldn't have said it better myself! See what I mean about blue? Gill in London made three pillows, also! 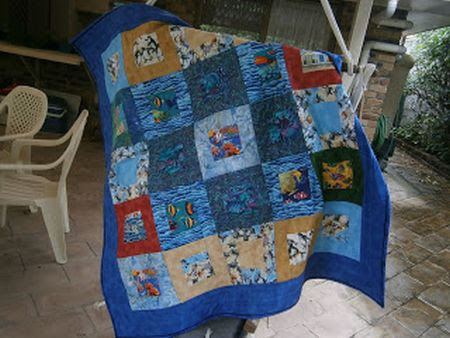 The fabric was bought and cut in 2005 - just before I had my first son. 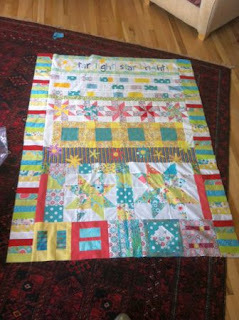 I naively thought that giving up work to have kids would result in lots of free time to quilt! I have 2 little boys and just like yours one is even called Jacob! 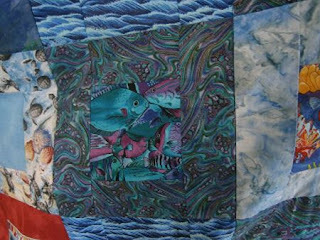 Now both of them are at school I am picking up on the quilting again - and your UFO project has helped to focus me! The problem was with these cushions that I couldn't even remember which pieces went where, so a lot of guesswork was involved. I also hand quilted them as my free motion quilting is so rusty! Ha ha Gill -- I thought when I left my job at the University to be a full-time Mom, I would have all the time in the world. I think many of us think that, to our sorrow! Noela sends Independence Day greetings from Australia -- thanks, Noela! 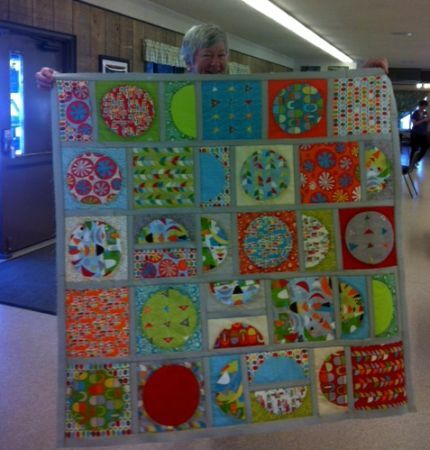 She finished two mini quilts for her June UFO project -- so cute! 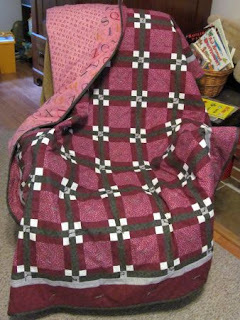 Noela, I have 12 of these mini quilts in my UFO cupboard. Maybe that should be my UFO project for 2014! 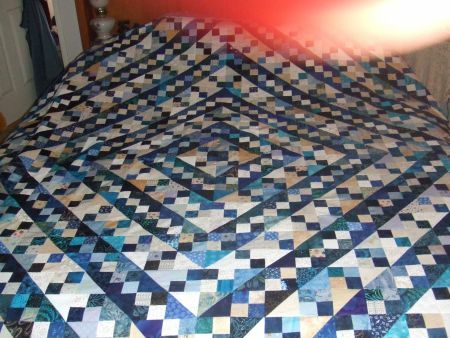 Another Aussie friend, Susan, finished another blue quilt! 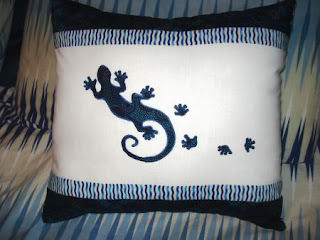 I guess blue is the favorite color of most people -- I know my Mother loved "any color as long as it's blue!" This quilt is the result of a block swap from Susan's patchwork group. The block is called "Happy Block" -- what a great idea for a super-easy block swap! The whole store is on Susan's Sewing Space. And thanks for the plug for Susie's Magic Binding, Susan! Here is a first-time UFO Parade participant, Kerry from San Diego. 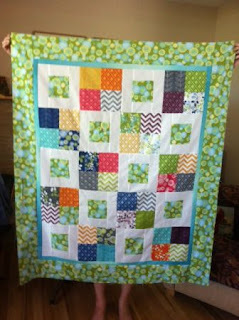 Kerry designed this darling baby quilt for her new granddaughter, just born June 20th. 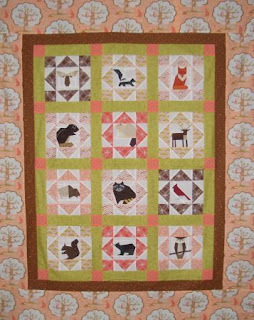 The animals are paper-pieced, and Kerry designed the rest of the quilt using EQ7. Nice job, Kerry, and congratulations on the new grandbaby! And it's an e-book, so it will be in your email inbox today! Congratulations, Martha! Tomorrow, I'll show you a photo of my July UFO project. Lucky for me, it's almost finished, because July is going to be a busy, busy month around here! Wow, what an amazing collection of UFOs this month. I can't believe how much everyone gets done! Impressive work by Martha and well deserving of the very appropriate prize! 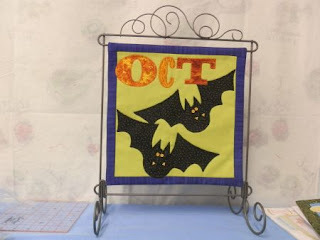 Amazing effort by Deb B with her start to finish UFO too and some other lovely projects in there too, its going to take me a while to check out all the links this month. I am in awe!!!!!!!!!! what inspiration you are... I am working on my new sewing room and have over 10 UFO's and you have given me hope that I can do it. Thank You! Yea for Martha! 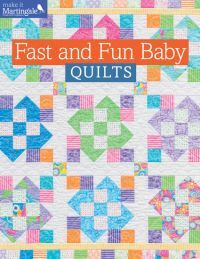 The row quilt is lovely and how wonderful to make that second baby quilt! :-) Thanks again for everything Marti, the monthly UFO parades are really inspiring posts. I agree with Sue! Irene, you've decided me. We'll have to do the UFO Challenge again next year -- not 14 in 2014, though, I think one per month will be enough! 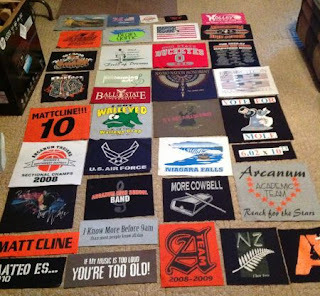 Wow, these all look great. I actually got my UFO done for June but forgot to send you a photo before I headed off for vacation. I'll send it in July hopefully with my July finish as well. I love your Blue Ridge Beauty quilt. I'm working on it too, but in purples. I have all my rows made. Now for assembly! Nice blog! I saw your plug on Kim's site.